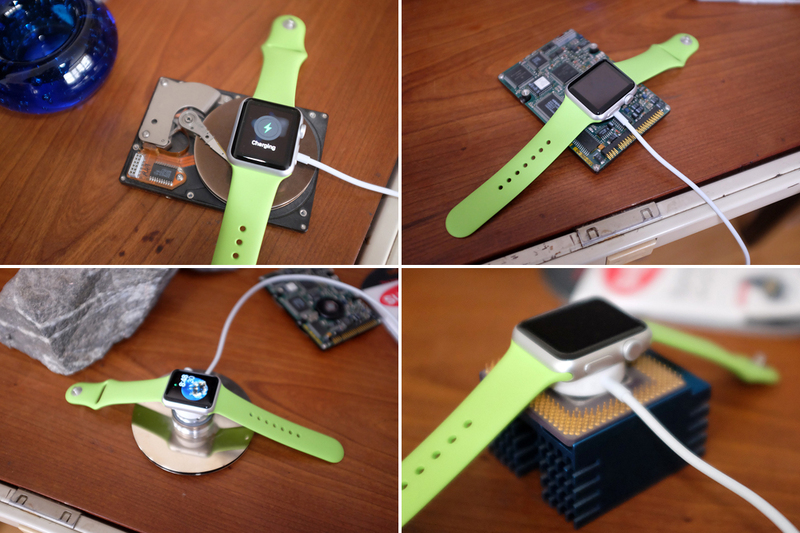 The high-end Apple Watch comes with a handsome case that doubles as a holder for the induction charging puck. Since we got the “Average Joe” version of Apple Watch we cannot confirm this particular feature (but there’s pictures of it on the Apple Watch Edition page). We can confirm, though, that Apple has an extra long USB cord attached to the charging puck. 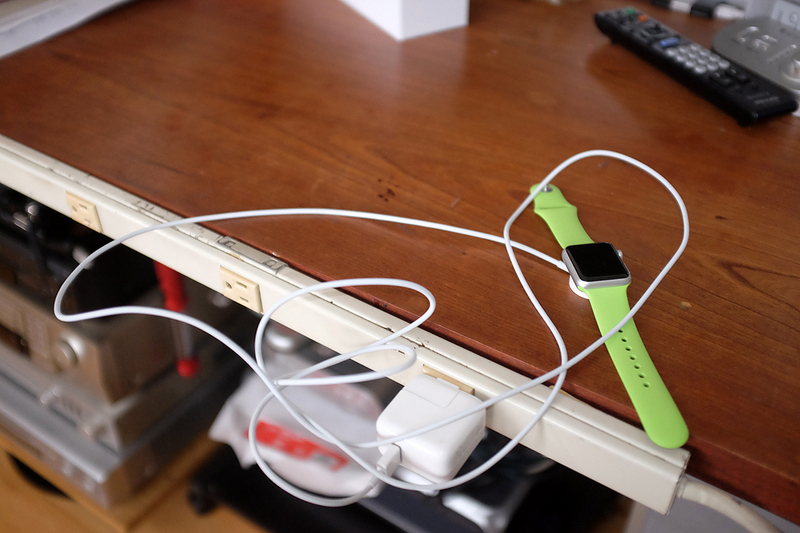 This means that Apple Watch owners can plug the charger into a wall socket and still have the puck reach the night stand or desk (i.e., you don’t have to leave it on the kitchen counter next to the coffee maker in order to charge it). Accessories makers, naturally, have recognized the opportunity and are going hell-for-leather in creating stands, bases, etc. 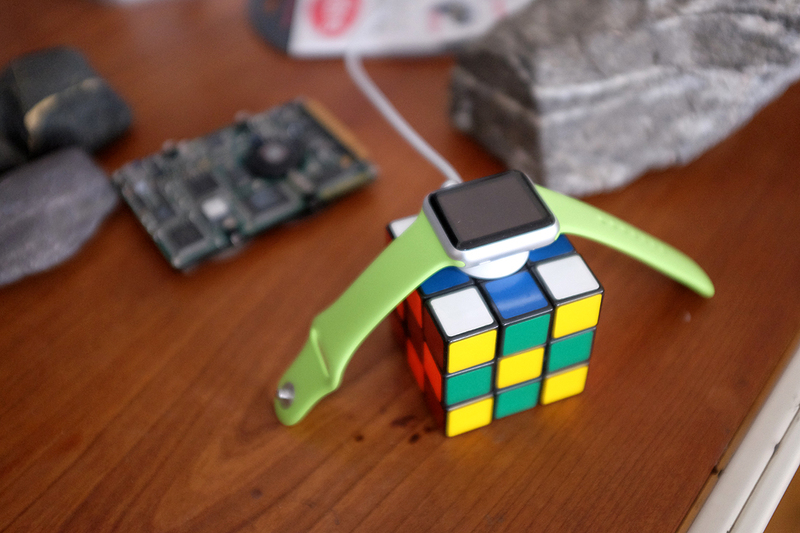 for the new Apple Watch owner. While we have seen a few practical ones, overall we have come away unimpressed. 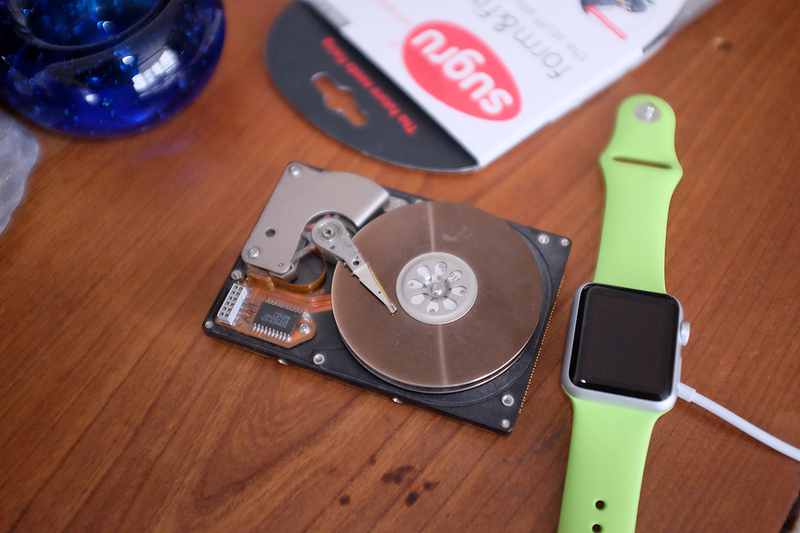 For those with tastes leaning toward the “techie/geeky” side, we suggest taking apart an old hard drive and using the guts. The platter side is pretty cool looking, but don’t discount the side with the chips. We came up with these potential “charger holders” in less ten minutes of looking around. 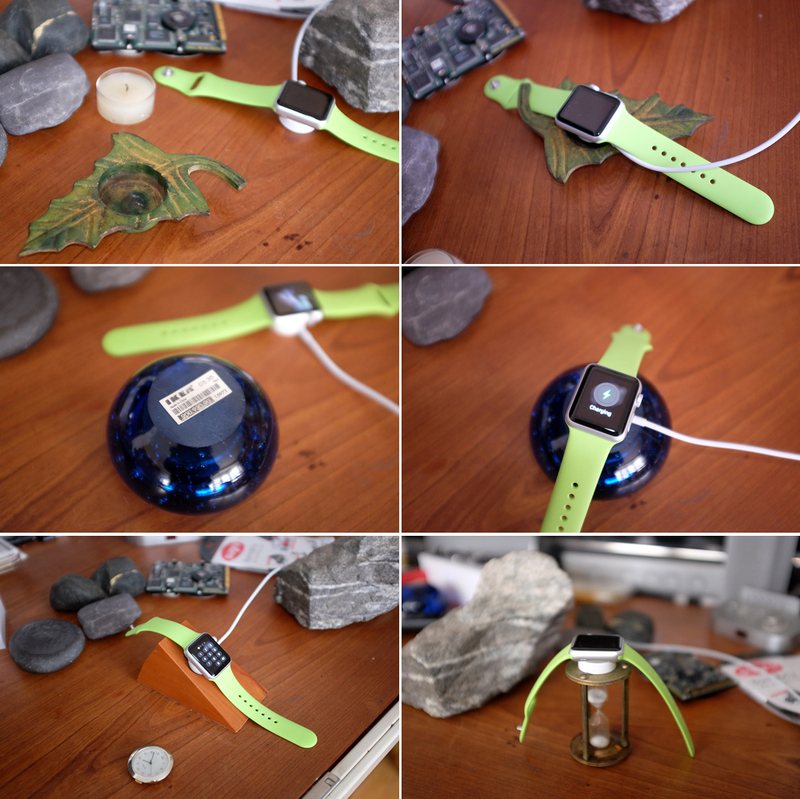 The point is, while there will undoubtedly a lot of very nice Apple Watch charger holders out there, with more coming, we think Apple Watch owners may already have some pretty cool ones on the shelf, in the drawer, or in the kitchen. 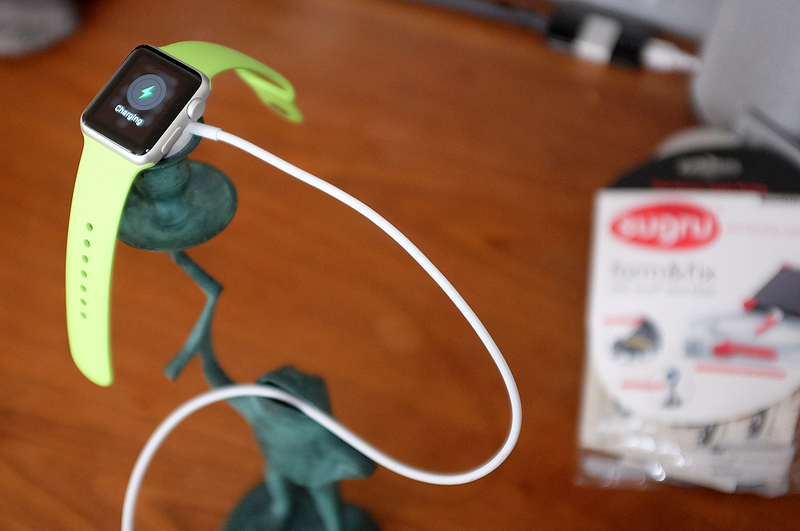 Look around, you may be pleasantly surprised how quick and easy it is to come up with a pretty decent DIY Apple Watch charging dock/stand. Binder clip to the rescue! I attached a medium binder clip to a small lamp on my headboard (cylindrical shape, opening at top). The charger cord goes through the black body of the clip. The watch hangs on the clip by the slot in the sport band. 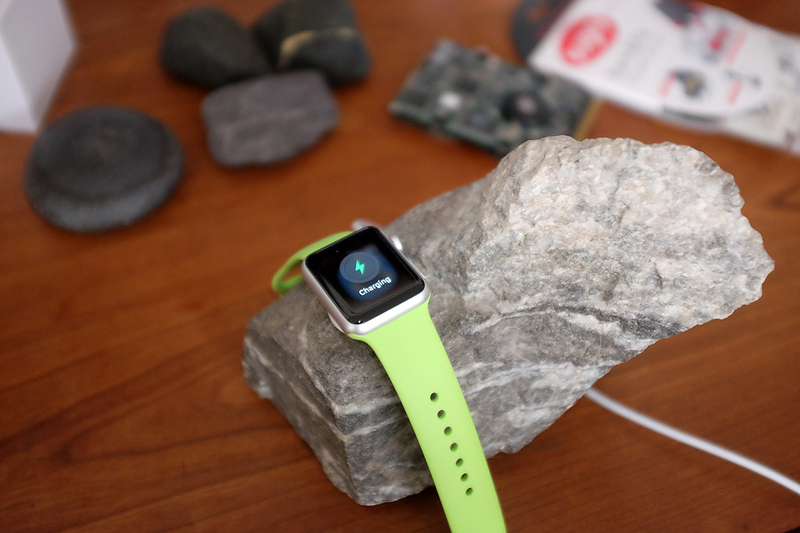 The charger then attaches magically – I mean magnetically. One could easily attach the binder clip directly to the head board, the wall, inside a drawer or cabinet or to an appropriately sized object. btw I would not attach the charger to an object with such permanency as Sugru, but with a velcro dot instead. Hook side of the dot to the object, loop side to the charger. That way the charger cord can be easily packed up for travel.